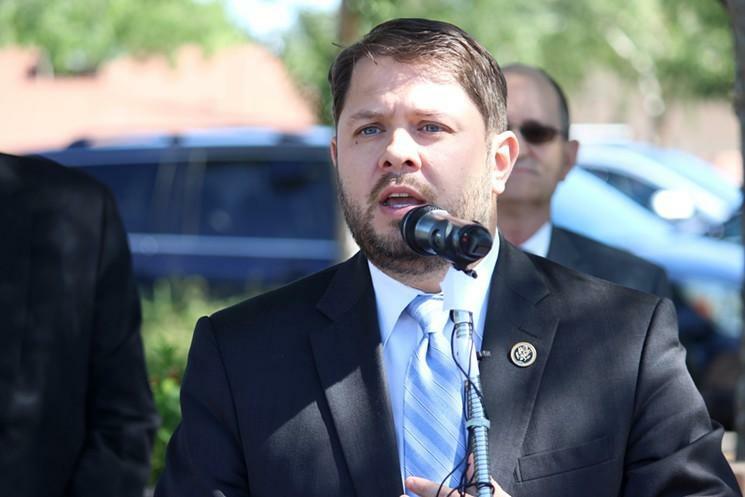 Rep. Ruben Gallego said Monday he won't run for the U.S. Senate, likely avoiding a contentious fight for the Democratic nomination to finish John McCain's last term. Gallego is well-connected to the liberal base of the Democratic Party, and many activists hoped the Phoenix Democrat would provide an option to the left of Mark Kelly, a retired astronaut who has run a centrist campaign since he jumped into the race last month. But Gallego, whose spokesman confirmed to the Associated Press that he would not run for the seat after it was reported by the Arizona Republic, said he doesn't want to engage in a bitter primary before pivoting to the general election for a seat that's crucial for Democrats eying the Senate majority. "It's just not in the best interest of the state or the Democratic Party to be engaging in that," Gallego told the newspaper. "If Republicans are excited to see a spirited and nasty primary, they're going to have to look somewhere else because I'm not going to take part in that." Arizona has long been a Republican stronghold, but Democrats made big inroads in 2018 and see the state as potentially competitive in next year's presidential election. Republicans hoped a Gallego run would pull both candidates to the left and alienate voters with months of negative campaigning that would allow GOP Sen. Martha McSally to focus on the general election. McSally was appointed to the seat and took office in January. Gallego, 39, is in his third term representing south and west Phoenix in Congress, making him one of the highest-ranking Latinos in elected office in Arizona. He's built a liberal voting record and has become a prolific critic of President Donald Trump on his Twitter feed. Gallego served in Iraq with the U.S. Marine Corps and is a graduate of Harvard University. His former wife, Kate Gallego, was a Phoenix city council member and was recently elected mayor. Kelly has signaled he'll run a centrist campaign like the successful one waged in 2018 by fellow Democrat Kyrsten Sinema. He retired from NASA and became an advocate for gun control laws after his wife, former U.S. Rep. Gabrielle Giffords, was shot in the head in an unsuccessful assassination attempt during a constituent event in 2011. McSally is a former congresswoman from the same district as Giffords. She was appointed to McCain's seat after she narrowly lost to Sinema in the election for Arizona's other Senate seat. McSally leaned heavily in that campaign on her record as the first woman to fly a combat mission. The 2020 election will decide who finishes the last two years of McCain's term. The seat will be up again for a full six-year term in 2022. Arizona lawmakers who hoped the expulsion of Rep. Don Shooter over sexual harassment allegations would put the issue behind them have been sorely mistaken. The subject continues to dog members of the House of Representatives and Speaker J.D. Mesnard. Arizona Sen. Martha McSally says she talked to President Donald Trump about his comments disparaging John McCain. Former Arizona Attorney General Grant Woods says he won't run against Republican U.S. Sen. Martha McSally in what's likely to be one of the most hotly contested Senate races of the 2020 election.